A crowbar can be used used to dispatch a zombie in two different ways, bludgeoning or puncturing the brain through the eye socket. A crowbar should only be used as a weapon if it is sufficiently long to maintain a reasonable space between yourself and a zombie. Licensed Bendable SUPERMAN Flexible Steel Bar with Realistic STEEL BENDING SOUND Super Hero Costume Accessory. 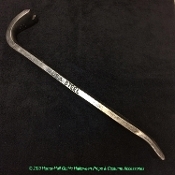 As the Gunmetal metallic silver-gray color faux Crowbar is bent, or button is pushed, metal-breaking steel-bending sound noises are emitted for added fun! Also makes an ideal cosplay Superman, Comics Super Hero, Hulk, Handyman, Mechanic, Thug, Serial Killer, Zombie Hunter, Half Life Game Character Circus Carnival Strong Man or Redneck costume accessory. Approx 24.5-inch (61.25cm) Long x 5.5-inch (13.75cm) at Widest point. 1.5-inch (3.75cm) Diameter Thick Bar. Officially licensed Superman costume accessory.